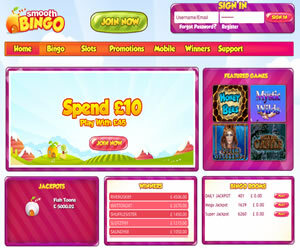 Smooth Bingo launched it’s peachy offering to the players on 27th June 2014, another brand to join the Live Bingo Network and be powered by the Cozy Games software. Land at the site and it will certainly whet your appetite because the design has a very ‘tasty’ feel – very fitting for the brand name. It would be fair to say that the homepage has a distinct James and the Giant Peach feel to it. Other features including details of the latest winners, a selection of the instant win games, a little blurb about what Smooth Bingo has to offer from the owner’s perspective and then there is the main flash banner advertising the welcome offers. The question is as to whether this site is a sweet as the design would have us believe. The only way to find out is to register and we’ll be honest, we were a bit dubious knowing how complicated it can be to register with the brands on the Live Bingo Network if you have other accounts on the same network. The first hurdle was that our email address was already registered. If you ‘fudge’ one you will not be eligible for the no deposit required bonus on offer because validation is required through a link in the welcome email. You can’t even take a look around the site without being able to validate your account. When you finally manage to get in to the lobby (if you haven’t given up and gone home), you will find the usual game offerings from the Cozy Games camp. The lobby is where you will see all the site activity and an abundance of information about what is happening in all the rooms. Smooth Bingo offers three variants of the online game; 75 ball, 80 ball and 90 ball show from the lobby but Cozy Games sites also have the option to host 30 ball games (there were just none available at the time of the review). With so much information available from the lobby, it’s easy to choose a room that suits your gaming requirements. Whilst we may not be overly impressed with the palaver in registration, Smooth Bingo does redeem itself a little with the ability to use your bonus funds on the slot and instant win games available. Simply choose bonus rather than cash when you load a game up. Remember though, if you play bonus funds and win, you will get bonus funds back. 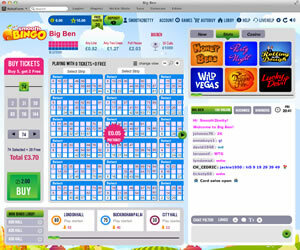 The layout of the bingo rooms is easy to follow with ticket purchasing pretty simple. Your purchasing options are to the left of your screen but this becomes the call board when a game is in play. 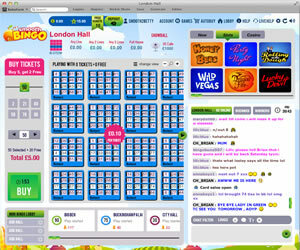 In the centre of the screen are your bingo tickets with the game information above and chat and instant win games over to the right of the screen. Promotions are pretty limited at Smooth Bingo although the schedule has improved over the network recently. Sadly this site is just another like many online today but whilst we may not be big fans, you may be. The fact that so many of these brands are launching would indicate that for some players, Cozy Games is the platform of choice. If you are one of those players then Smooth Bingo will probably be a favourite on your menu. Smooth Bingo is able to offer players an impressive variety of bingo games. There is 75 ball, 80 ball and 90 ball with the option to have 30 ball games if required. In addition to this there is an impressive array of instant win and side games available. Wagering requirements on deposits vary at Smooth Bingo dependent on the option you choose for the bonus - bonus funds or cash. For bingo the wagering requirement if bonus cash accepted is 4x the amount of deposit + bonus received or for any other game besides bingo it is 10x the amount of deposit + bonus received. 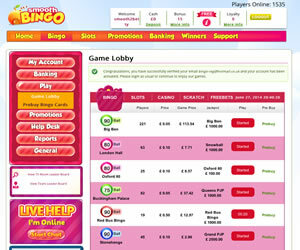 You should note that you can only request one withdrawal in any given seven day period at Smooth Bingo.